LG's new Android powered tablet has a name that doesn't exactly roll off your tongue. 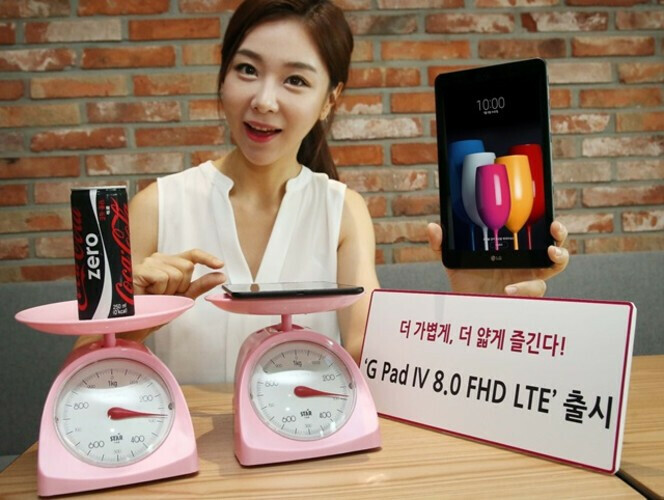 The LG G Pad IV 8.0 FHD is an extremely light slate (it weighs about the same as a can of Coke) made for people on the go. At 290 grams, this tablet is light. At 216.2 x 127.0 x 6.9mm, the device is built to fit easily into briefcases and bags. As you can tell from the name of the tablet, the LG G Pad IV 8.0 FHD comes with an 8-inch screen carrying a resolution of 1200 x 1920 (FHD). The unit carries an aspect ratio of 16:10. Powering the tablet is the Snapdragon 435 chipset, which includes an octa-core 1.4GHz CPU and the Adreno 505 GPU. 2GB of RAM is inside along with 32GB of native storage. A 2TB capacity micro SD slot is available for those seeking additional storage. Both the back and front-facing cameras weigh in at 5MP, and the tablet's lights are kept on thanks to a 3,000mAh battery. Android 7.0 is pre-installed. Some of the features include an "easy-to-view mode," which reduces the blue light from the screen in four steps. This reduces strain on your eyes and might help you fall asleep better. Dual Windows is also offered as is Knock On and Knock Code, which allows you to lock and unlock the tablet by tapping a particular pattern on the screen. Sold in dark brown, the LG G Pad IV 8.0 FHD is priced at the equivalent of $305 USD. Available for the equivalent of $71 USD is the "PlusPack," which works as a stand and comes with an extra battery, and USB ports. The tablet is being offered only in South Korea at present and there is no word about taking it overseas. Funny how the spec sheet has been moving backwards for 4 years straight in the G-pad line. I was happy with my original G-pad from 2013 - 8.3" screen FHD, 16 GB storage, Snapdragon 600, 2gb RAM, 4600 mAh battery. Those are specs from 4 years ago boys and it cost less than $300 back then. Let that sink in. Who said so because that's false. it is, both on benchmark and on paper. The point Tondern was trying to say was 4 years ago the original G-Pad was using flagship specs with a low price, now the new G-pad is just low end with a high price. Wow, finally a new tablet with a 16:10 screen. Pity it's not OLED but I think I'll get one anyway once it escapes South Korea.